“On November 13th, 2017, at approximately 11:12 P.M., Fourth District police officers were in the 700 block of Kennedy Street, N.W., when they heard multiple gunshots (6 shots) coming from the 700 block of Longfellow Street, N.W. The MPD Units immediately responded towards the gunfire and began canvassing the area. 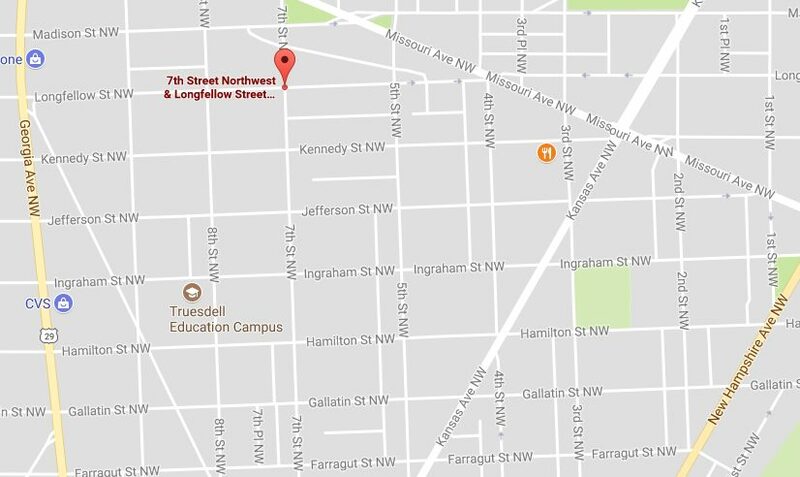 While the units were canvassing, a victim called 911 and reported that a stray bullet had gone through his bedroom window and struck the bedroom wall in the 600 block of Longfellow Street, N.W. The victim reported hearing 5 gunshots, followed by a brief pause, then the sound of car tires screeching. Immediately after the victim heard the car speed away, he heard another louder gunshot which shattered his bedroom window and struck the bedroom wall. Fortunately, no one was injured as a result of these gunshots. Several other witnesses were interviewed, and reported similar accounts. Moments after the Officers heard the gunshots, they observed a vehicle speeding westbound in the 700 block of Kennedy Street, N.W. The officers stopped the vehicle. The driver of the vehicle reported that he fled the area when he heard the gunshots. He stated that he did not see who fired the shots and he did not know where the shots came from. The driver was released after the officer’s completed their investigation.